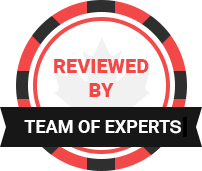 There are many systems used in gambling, and in a large number of cases, roulette provides the perfect platform for the system. One such system is the Labouchere Betting System, which also known as the Cancellation system or the Split Martingale. In this article I examine every aspect of the Labouchere betting system. I start with an explanation of the system itself. Then I take a look at the advantages of the system before moving onto the disadvantages and the dangers. I finish with an overview of the system. Before you start playing at the table you’ll first consider how much you actually want to win. You’ll then break down this down into betting units. For example, you might want to win $50 by betting in $5 units. This means that you will aim to win 10 units. You’ll then write a line of numbers which add up to the total amount of units. This line will usually be a series of ones. However, you can use a mix of numbers. If the bet loses however, you’ll add a number to the right hand side of the line equal to the size of the last bet. This is how the line would look if the first bet lost. You’ll then repeat the action over and over again, striking the numbers at either end if the bet wins and adding a number to the right hand side if it loses (this number being the size of the losing bet). Important: Your aim is to clear all the numbers, and when this happens you’ll have won the original amount you had aimed to win. The biggest advantage of the Labouchere betting system is the fact that you’ll actually achieve your aim the majority of the time. Consider that every time you win the line will reduce in length by 2, and every time you lose the line will increase by only one. This means that you’ll only have to win a third of the time to maintain the line. In reality, you’ll expect to win much more than a third of the time, so the line will eventually shrink to nothing, meaning you’ve met your aim. So far, it’s all sounded positive and virtually guaranteed, so where is the catch? The catch is that after a losing run some of these numbers can become big, possibly too big for your bankroll to handle. At this point you are still only four or five spins away from winning, but your next bet size is $285 (based upon the $5 unit stake), and if it loses it will increase again. If the bet sizes become too big, you might have to quit, having made a much bigger loss than the amount you wanted to gain. There is one fact that should be evident to all when playing roulette: You will not beat the house edge. As such, any system will fall down in the long run. Having said that, if we avoided all long term losing situations when playing roulette, we’d never actually play the game at all. Using a system can be a fun way to spend your time at the table, and the Labouchere system is most definitely an interesting one. Added to this, you’ll have many occasions where you will indeed achieve your aim. However, the bad runs can be very harmful, so I’d suggest setting yourself a limit, where you’ll only wager a certain amount before giving up, otherwise the amounts could get out of hand.